Scroll over the image below for an illustration of the impact and extent that accreditation has in the construction sector and the built environment. DESCARGUE AQUÍ la versión electrónica del libro ADVANCES IN VIBRATION CONTROL AND DIAGNOSTICS donde podrá consultar las contribuciones y resultados de los participantes en este proyecto internacional. Podrá analizar, entre otros, interesantes trabajos de colegas de Cuba, Brasil, España, Italia y Alemania. Sexto, Luis Felipe (2006) The Noise Emission and Immission Levels in a Thermoelectric Power Station. In: Advances in vibration control and diagnostics. Polimetrica Publisher, Italy, pp. 227-234. Sexto, Luis Felipe (2006) Overview and Characterization of a Flexible Rotor for Trial Run. In: Advances in vibration control and diagnostics. Polimetrica Publisher, Italy, pp. 235-246. Marín, Evelio Palomino and Rodríguez, Ángel Sánchez and Gómez, Jesús Cabrera and Cabrera, Luis Felipe Sexto (2006) Preliminary Diagnosis of Rotational Machinery. Experiences in the Implementation of a Predictive Maintenance Program and Certification of Human Resources in a Cuban Cement Industry. 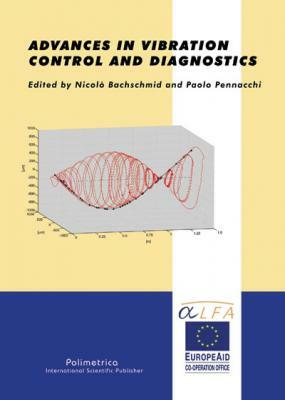 In: Advances in vibration control and diagnostics. Polimetrica Publisher, Italy, pp. 177-184. This volume presents some up to date concepts and results in the field of vibration control and diagnostics of mechanical systems, obtained in research activities performed in the Departments and laboratories of the universities taking part in the VICONDIA network. The VICONDIA project developed in the frame of the ALFA II Program for the cooperation between European and Latin American universities, funded by the European Commission, has promoted tight cooperation in the research activities in the field of dynamical behaviour of rotating machinery including noise emission, vibration control of mechanical structures, and related diagnostics. A selection of the main results in form of papers, originated by these research activities, is reported in the volume, which therefore contributes to describe the state of art of the activities in the above defined field. Alamo, Fredy Coral and Weber, Hans Ingo (2006) Vibrational Behavior of Slender Drillstrings. In: Advances in vibration control and diagnostics. Polimetrica Publisher, Italy, pp. 1-11. Bachschmid, Nicolò and Tanzi, Ezio (2006) Coupling of the Lateral and Torsional Vibration in a Cracked Shaft. In: Advances in vibration control and diagnostics. Polimetrica Publisher, Italy, pp. 13-26. Bueno, Douglas Domingues and Marqui, Clayton Rodrigo and da Silva, Samuel and Lopes Jr, Vicente (2006) Structural Damage Location Using H2 Norm Approach. In: Advances in vibration control and diagnostics. Polimetrica Publisher, Italy, pp. 27-36. Cardoso, Patrick M. and Santana, Danuza and Bachschmid, Nicolò and Pennacchi, Paolo and Tanzi, Ezio and Steffen Jr, Valder and Rade, Domingos Alves (2006) Active Control of a Thin Plate Using Piezoelectric Patches: Preliminary Results. In: Advances in vibration control and diagnostics. Polimetrica Publisher, Italy, pp. 37-48.
dos Santos, Rogério Rodrigues and Kreschel, Martin and Pereira Saramago, Sezimária de Fátima and Steffen Jr, Valder (2006) Serial Robot Vibration Analysis Through Task Positioning Optimization. In: Advances in vibration control and diagnostics. Polimetrica Publisher, Italy, pp. 49-64. Ehehalt, Ulrich and Hochlenert, Daniel and Markert, Richard and Weber, Hans Ingo (2006) Approximate Description of Backward Whirl at Rotor-Stator-Contact. In: Advances in vibration control and diagnostics. Polimetrica Publisher, Italy, pp. 65-82. Ehehalt, Richard and Markert, Richard and Hahn, Eric (2006) Rotor Stator Contact – Measured Motion Patterns. In: Advances in vibration control and diagnostics. Polimetrica Publisher, Italy, pp. 83-98. Ehehalt, Ulrich and Markert, Richard and Wegener, Georg (2006) Synchronous Forward Whirl At Rotor-Stator-Contact – Stability Investigations. In: Advances in vibration control and diagnostics. Polimetrica Publisher, Italy, pp. 99-113. Frosoni, Lucia and Pennacchi, Paolo (2006) Determination of Radial and Tangential Electromagnetic Stresses in Synchronous Machines Caused by Rotor Eccentricity. In: Advances in vibration control and diagnostics. Polimetrica Publisher, Italy, pp. 115-130.
de Lima, Antônio Marcos Goncalves and Rade, Domingos Alves and Markert, Richard (2006) Finite Element and Experimental Results of Vibration Control of Beams Combining ACLD and PPF. In: Advances in vibration control and diagnostics. Polimetrica Publisher, Italy, pp. 131-142. Kreschel, Martin and Markert, Richard and Seidler, Malte and Steffen Jr, Valder (2006) Non-Stationary Balancing of Flexible Rotors With Speed-Dependent System Matrices. In: Advances in vibration control and diagnostics. Polimetrica Publisher, Italy, pp. 143-150. Furtado, Rogério Mendonça and Pennacchi, Paolo and Lopes Jr, Vicente (2006) Fault Identification in Rotor System Using Model Based Methods Experimental Data and Artificial Neural Network. In: Advances in vibration control and diagnostics. Polimetrica Publisher, Italy, pp. 151-162. Michalski, Miguel Angelo C. and Zindeluk, Moyses and Rocha, Renato O. (2006) Non-Linear Experimental Detection of Oil Whirl in Horizontal Rotors. In: Advances in vibration control and diagnostics. Polimetrica Publisher, Italy, pp. 163-175. Pennacchi, Paolo and Vania, Andrea (2006) Dynamical Effects Caused by Rotor-to-Stator Rubs in a Steam Turbine. In: Advances in vibration control and diagnostics. Polimetrica Publisher, Italy, pp. 185-204. Saldarriaga, Manuel Villafañe and Steffen Jr, Valder and Santos, Ilmar Ferreira (2006) Theoretical and Experimental Analysis of a Viscoelastic Vibration Absorber in a Frequency Band. In: Advances in vibration control and diagnostics. Polimetrica Publisher, Italy, pp. 205-216. Sekhar, A. S. and Platz, Roland and Markert, Richard (2006) Health Monitoring and Crack Identification in a Rotor System Passing its Critical Speed. In: Advances in vibration control and diagnostics. Polimetrica Publisher, Italy, pp. 217-225.
d’Avila Villela, Ricardo Luís and Zindeluk, Moyses (2006) Detection of Holes in Ducts using Acoustic Probing. In: Advances in vibration control and diagnostics. Polimetrica Publisher, Italy, pp. 247-257. Polimetrica License B gives anyone the possibility to distribute the contents of the work, provided that the Authors of the work, the Institute and the Publisher are always recognized and mentioned. It does not allow use of the contents of the work for commercial purposes or for profit. The Publisher has the exclusive right to publish and sell the contents of the work in paper and electronic format and by any other means of publication. Additional rights on the contents of the work are the Author’s property. PlanetRAMS-Suscríbete a nuestro canal y sigue toda la actualidad RAMS. TIPOS DE MANTENIMIENTO ¿CUÁNTOS Y CUÁLES SON? A guide to the project management body of knowledge (PMBOK guide). Di David J. Smith. Reliability, Maintainability and Risk: Practical Methods for Engineers. Harold Kerzner. Project Management: A Systems Approach to Planning, Scheduling, and Controlling. Joseph M. Juran. Juran’s Quality Handbook. Joseph M. Juran. Managerial breakthrough: a new concept of the manager's job. Kaoru Ishikawa. What is total quality control? The Japanese way. Peter F. Drucker. Management: tasks, responsibilities, practices. Peter F. Drucker.The Practice of Management. Peter M. Senge. La quinta disciplina. Seiichi Nakajima. Introduccion Al TPM (Mantenimiento Productivo Total). Terry Wireman. Developing performance indicators for managing maintenance. W. Edwards Deming. Out of the crisis. W. Edwards Deming. The new economics: for industry, government, education. “Every part used on the [Rolls Royce] car is constructed to specific ISO requirements.” Tom Purves, CEO of Rolls-Royce Motor Cars. ISO 9001:2015 and ISO 14001: 2015 are implemented by over a million organizations in 175 countries. ISO 9001:2015 e ISO 14001: 2015 son implementadas por más de un millón de organizaciones en 175 países. Una reciente investigación, por parte del órgano de normalización alemán (DIN) -que comprende el análisis de 4000 empresas de Alemania, Austria y Suiza- ha dado por resultado lo siguiente: el 62% de los representantes de las empresas considera que el uso de las normas semplifica la definición de los contratos. El 54% considera que las normas reducen las barreras comerciales; y un 36% opina que el uso de las normas prepara mejor a las organizaciones en el respeto a las legislaciones. ISO 9001 and ISO 9004 form a consistent pair of standards on quality management. ISO 9001 aims to give quality assurance of product and to enhance customer satisfaction, while ISO 9004 uses a broader perspective of quality management to give guidance for performance improvement. ISO 9001 e ISO 9004 forman un consistente par de normas sobre gestión de la calidad. ISO 9001 brinda la seguridad de la calidad del producto y la satisfacción del cliente, mientras ISO 9004 Utiliza una perspectiva de gestión de la calidad para aportarnos una guía para la mejora del desempeño y la sostenibilidad. ISO/TC 207 is the ISO technical committee responsible for developing and maintaining the ISO 14000 family of standards. ISO/TC 176 is the ISO technical committee responsible for developing and maintaining the ISO 9000 family of standards. LOS ENAMORADOS DE LA DAMA DE HIERRO: La conocida Dama Hierro, símbolo de Francia desde hace poco más de un siglo, necesita la visita diaria y oportuna de un equipo de 34 enamorados. Estos hombres, electricistas, mecánicos, pintores, fontaneros, cerrajeros y carpinteros; constituyen el grupo de mantenimiento que día a día permiten que la torre Eiffel de 320 metros de altura, se mantenga disponible y con todos sus sistemas funcionando. LA OPINIÓN DE JURAN: Joseph Juran, el célebre teórico fallecido en 2008, y gestor de la llamada “Biblia de la Calidad” el Manual de Control de Calidad; formó parte del primer movimiento por la calidad en Japón. Según su autorizado criterio las tres características que llevaron a la revolución en la industria japonesa en las actividades de control de calidad fueron: un programa masivo de formación relativa a la calidad; la existencia de programas anuales de mejora de la calidad y la apropiación por la dirección del liderazgo de la función de calidad. ¿LO MÁS IMPORTANTE? REDUCIR COSTOS En la Antigua planta de ascensores Berliner Aufzug Fahrtreppenbau (BAF) de Berlín del este, para producir un elevador se utilizaba el doble de material y el atraso tecnológico estimado era de 40 años. Todavía finalizando los 80 del siglo pasado se ensamblaban elevadores de madera. El director subía hasta su oficina en un ascensor con botones para diez pisos, aunque el edificio solo tenía cuatro. El hecho de fabricar siempre el mismo panel de botones independientemente de la necesidad era considerado un criterio para reducir los costos. ENFRENTAMIENTO AL FALLO CON EL ANÁLISIS "CAUSA RAÍZ". Noche de febrero de 1989: desastre en la bomba de inyección de petróleo crudo en una refinería. Pedazos de la bomba salen despedidos, incendio local, bomba destruida…¡Alarma! Luego de sofocar el desastre, que milagrosamente no cobró vidas humanas, se crea un equipo para analizar los hechos. Deciden emplear métodos de Análisis Causa Raíz ya que se considera inadmisible que vuelva a suceder una avería con de tales consecuencias. Con estos procedimientos se logró la reconstrucción del suceso y se determinaron las causas que lo originaron. Luego siguió la decisión de implementar un programa de monitoreo para diagnosticar la condición de un conjunto de máquinas que también se consideraban susceptibles de fallar de igual manera. Se trata de un caso donde, lamentablemente, se decide hacer uso de las herramientas de análisis existentes luego de un acontecimiento catastrófico. MANTENIMIENTO SEGÚN CONDICIÓN EN LA ERA DE LOS SISTEMAS INTELIGENTES. Sí, que nadie dude que estamos en la era de los sistemas inteligentes, aunque a veces falte inteligencia a los sistemas. Cualquier cosa que quiera llevar el calificativo de inteligente tiene que cumplir con la condición de aprender, de sus interacciones y experiencias, a comportarse y actuar efectivamente para cumplir sus objetivos. Por ello, las técnicas que representan al mantenimiento según condición, ya de por si conceptualmente más “inteligentes”, se yerguen en una nueva dimensión con la posibilidad de aprender a decidir correctamente sin recibir nuestras ordenes directas. ¿Ciencia ficción? ¿Demencia tecnológica? No, no, estimados colegas, se trata de una realidad posible y previsible dado el nivel actual y desarrollo exponencial de la tecnología. El mantenimiento, que tiempo atrás fue subvalorado, ahora ya se desarrolla y se beneficia igualmente del avance conceptual y técnico. Décadas ha costado hacer entender y avanzar los procesos de mantenimiento. Ahora ya estamos hablando con orgullo del Mantenimiento según condición en la era de los sistemas inteligentes. 17.MATURITY MODEL FOR RCM APPLICATIONS. Proceedings of the EuroMaintenance 2010, - May 2010, (Verona, Italy). 16.MANUTENZIONE & SICUREZZA: La Manutenzione tra l’incertezza e la statistica. Manutenzione Tecnica e Management, Anno XV - numero 2 - Febbraio 2008, revista oficial de la Asociación Italiana de Mantenimento (AIMAN), (ISSN 1123-1084). 15.MANUTENZIONE & AFFIDABILITA: L'AFFIDABILITÀ INTEGRALE DELL'ASSET INDUSTRIALE. Manutenzione Tecnica e Management, Anno XV - numero 1 - gennaio 2008, revista oficial de la Asociación Italiana de Mantenimento (AIMAN), (ISSN 1123-1084). 14.La confiabilidad integral del activo (artículo publicado en la revista Ingeniería Mecánica, Volumen 11 / No. 1. enero-marzo del 2008, p 49~66, ISSN 1029-516X, revista referenciada, indexada en UW Libraries Catalog Record y Latindex). 13.TRIZ, SIX SIGMA Y RCM. Entre el reto innovador y la necesidad industrial. Revista MANTENIMIENTO, revista de la Asociación Española de Mantenimiento (AEM)., noviembre de 2007, número. 209 (ISSN-0214-4344). 12.Confiabilidad y Mantenibilidad integral del activo. Proceedings de la convención METANICA 2007 (evento Mantenerg 2007). La Habana, Cuba (ISSN - 1607 – 6281). 11.Síndrome del edificio enfermo: Ruido y Vibraciones como factores de riesgo. Proceedings de la convención METANICA 2007 (evento Mantenerg 2007). La Habana, Cuba (ISSN - 1607 – 6281). 10. RELIABILITY CENTERED MAINTENANCE E MANUTENZIONE SU CONDIZIONE E PREDITTIVA. Manutenzione Tecnica e Management, revista oficial de la Asociación Italiana de Mantenimento (AIMAN), abril de 2007 (ISSN 1123-1084). 9. Mantenimiento industrial: Cenicienta que aguarda por su príncipe (artículo publicado en la revista Ingeniería Mecánica, Volumen 3 / No. 1. enero-marzo del 2000, p 93~96, ISSN 1029-516X, revista referenciada, indexada en UW Libraries Catalog Record y Latindex). 8. Ruido: implicaciones que acompañan a los niveles registrados en la central termoeléctrica Habana. (Ingeniería Mecánica, No. 3 p25-29, del 2002, ISSN 1029-516X, revista referenciada, indexada en UW Libraries Catalog Record y Latindex). 7. Seguridad industrial y minera: aspectos estratégicos para el control pasivo de ruido (artículo publicado en la revista Ingeniería Mecánica Volumen 4, No. 2, ISSN 1029-516X, revista referenciada, indexada en UW Libraries Catalog Record y Latindex). 6. Ruido, normativa y legislación en Cuba. (Revista Normalización, No. 2-3/ 2003, p.14-20, ISSN 0138-8118). 5. Overview and characterization of a flexible rotor for trial run, enero-febrero, 2006. (ISBN: 887699-036-4 printed edition and ISBN: 88-7699-016-X Electronic edition). 4. The noise emission and immission levels in a thermoelectric power station, marzo 2006. (ISBN: 887699-036-4 printed edition and ISBN: 88-7699-016-X Electronic edition). 3. Palomino E, Cabrera Jesús, Sexto L.F: Preliminary diagnosis of rotational machinery. Experiences in the implementation of a predictive maintenance program and certification of human resources in a Cuban cement industry, abril de 2006. (ISBN: 887699-036-4 printed edition and ISBN: 88-7699-016-X Electronic edition). 2. Bachschmid N., Tanzi E. , Santos M.B. , Sexto L.F. Some Experimental Results in Rubbing Phenomena Analysis. Proceedings of the XII International Symposium on Dynamic Problems of Mechanics (DINAME 2007),Varoto, P. S. and Trindade, M. A. (Editors), ABCM, Ilhabela, SP, Brazil, February 26 - March 2, 2007. PLANIFICACIÓN Y PROGRAMACIÓN DEL MANTENIMIENTO. ¿QUÉ HACER, CÓMO HACERLO Y CON QUÉ? EL CICLO DE LA CALIDAD, ¡QUE TONTERÍA MÁS GENIAL! Sostenibilidad, Mantenimiento y Gestión de Activos by Luis Felipe Sexto is licensed under a Creative Commons Attribuzione - Non commerciale - Non opere derivate 3.0 Unported License. Based on a work at se-gestiona.radical-management.com. Copyright ©2006-2019. Master Blog de Luis Felipe Sexto (Radical Management). All rights reserved. Tema Picture Window. Con la tecnología de Blogger.